In order to assess how climate change might impact certain livelihoods resources and social groups it is necessary to establish the level of exposure of these to relevant climate hazards that impact the region or sector of interest. This module is an introduction to developing indices of current vulnerability to climate and climate change. This makes use of a vulnerability exposure matrix, to identify exposure units and issues/threats of the exposure region, sector or community and guide the user to identify suitable indices. Process of applying this tool/method. Use a vulnerability matrix as a way to identify the region, sector, community, or livelihood of interest to identify who is vulnerable and to what. Identify major climate and other threats and associate relevant climate variables. Identify indicators relevant the and rank them. The aim is to link the indicators to the specific concerns recognised by the exposure matrix. Group the indicators into dimensions of vulnerability. Some simple steps that can be used to identify indicators of vulnerability are shown below (taken from AVA Assessment of Vulnerability for Adaptation, SEI, 2005). Compile profiles of the indicators. Access historic climate data and compare with historic events. Identify future hazards, through climate scenarios as a starting point for assessment of future vulnerability. (vi) To conduct scientific research (Verdict: No. Scientific inquiry can only be taken forward by formulating specific research hypotheses about cause and effect that can be tested by measurement or modelling rather than by applying arbitrary methods in an attempt to quantify the unquantifiable). In conclusion, Hinkel recommends that if vulnerability indicators are to be developed, they should only serve as high level entry points to further more detailed information behind. A concerted effort should be made to make the problems addressed and methodologies applied more explicit, which also requires that more specific terminology be employed as well, in particular avoiding all but the most qualified use of the all-embracing label "vulnerability" (Hinkel, 2011). 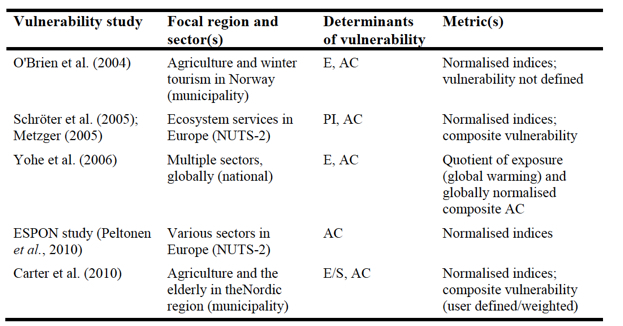 A selection of recent studies applying indicators and composite indices of vulnerability to climate change for different focal regions and sectors in Europe. Why is this method useful for the field of climate adaptation? They can be useful as communication and awareness raising tools that are easy for non-experts to grasp and work with, as well as for comparing elements (countries, regions, species, ...) and for informing policy makers. Creating an index of social vulnerability to climate change for Africa, Katharine Vincent. August 2004, Tyndall Centre for Climate Change Research Working Paper. Thornton, P.K. et al, 2006. Mapping climate vulnerability and poverty in Africa, Report to the DfID. ILRI, Nairobi, Kenya, Pp. 171. Livelihood Systems Profiling: mixed methods for the analysis of poverty and vulnerability. Fabio Pittaluga, FAO Fisheries Department, Nicola Salvati and Chiara Seghieri, University of Florence.